I like mongo soup. But one can only have too much of it. 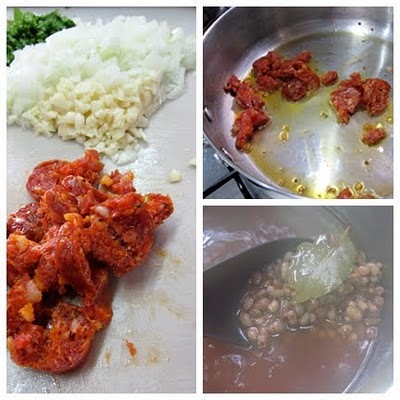 And so here’s a nice variation to prepping the beans. Moros y cristianos is actually just red beans and rice with a more controversial name; the dark beans representing the Moors and the white rice representing the Christians. The etymology’s a bit twisted but the dish itself is something simple and not too complicated to do as a weeknight meal. You can use a couple cans of red beans (or pinto or whatever type beans you like) for the recipe to cut cooking time by an hour or so. 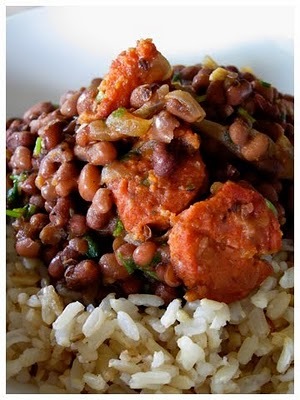 But for this recipe I prefer using dry red mongo/mung beans so I can infuse much more flavor in the hydration process. To start the recipe I rinse the dry beans in running water and then put them in a pot filled with about 5 times as much water. So if for example I have 1.5 cups of dry beans, I add in about 7.5 cups of water. To it I add some fresh oregano (or 1.5 tsp dry) and a couple of bay leaves. I put in a pinch of baking soda to quicken the softening process a bit. A stock cube at this point would also help build flavor. Heat till boiling and then simmer for about 40 minutes. The beans will be cooked but still be a little bit firm at this point; which is what we want as there will be more cooking along the way. In a pan I render some sliced chorizo in a tablespoon or so of olive oil. The more chorizo you use the more flavorful the end product will be. When the oil turns red I throw in a cup of chopped onions, garlic, some tomato paste, a teaspoon of dried thyme and 1.5 teaspoons of cumin. At this point I also put in a couple of labuyo chilies, but its optional if you don’t like the heat. When the onions have turned translucent I throw in the drained beans and about 1.5 to 2 cups of the boiling liquid and simmer for about 15 to 20 minutes. During the last 5 minutes, balance everything out with some apple cider or lime and salt and pepper. I also stir in some chopped cilantro at the end to keep the flavor and color bright. The end mixture should be moist and the beans just plump and done. Top this over some steaming hot white rice (or in this case, brown rice) and enjoy. Pretty hearty and nice to have during these recent rainy nights. Looks interesting, definitely a variation for mung bean lovers. I will try this out.